If you are a web-developer or a web-QA (QA who tests web-application), no matter where you work, what technology you use, what application you develop, there is always a need to test you application on various browsers. Not just different browser from different vendors but different versions of the same browser. Although there are various ways in which we could get IE 6, 7, 8 running side by side on Windows 7/Vista. All of these techniques need installing some software or installing a VM image (which takes up approx 1 GB space on the hard drive). In short its relatively long and painful process. Installing IETester - Although its not a complete browser but shows the rendering of your application pretty well. 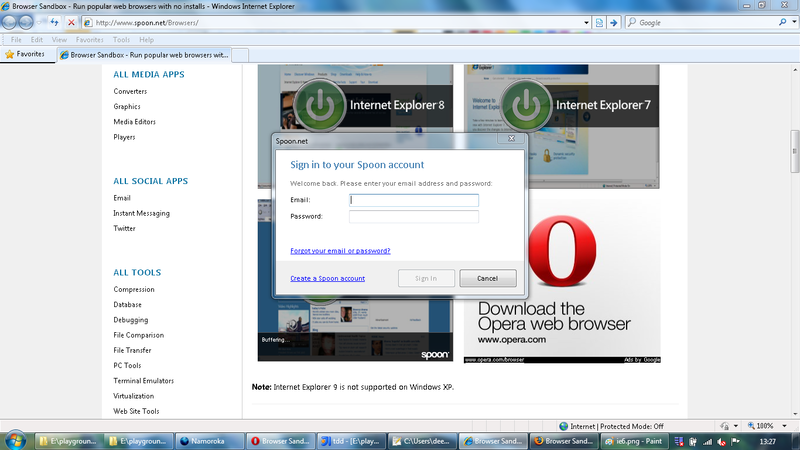 Works for IE 5.5, 6, 7, 8 and 9 (Great job IETester guys!). Relatively pain free technique to test your application on various IE versions. But its a difficult job to satisfy web-QA's, One of the QA's in my company said "I would not to believe IETester. 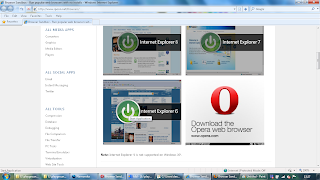 I want to test the application on actual IE 6"
Using the VM images - Relatively painful technique as it needs downloading VM images and Virtual PC software and a few more steps to get IE 6 and IE 7 running. Another approach (again based on the VM image) is described here - In this approach IE6 window appears as a seamless window along with other applications running on your machine. Nice approach, but still a lot of steps to get it running. We need to test our app on various versions of IE but what about versions of Firefox, Chrome, Safari and Opera? 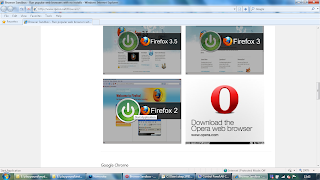 Web developers would agree that we need to test the application atleast on Firefox 2, 3, 3.5. Sure there are ways to install them and get them running side by side, but none of them are as simple as clicking a button. Although the title of this posts says getting different versions of IE running side by side on Windows 7/Vista, lets not ignore the other browsers and their versions. Lets get them running on Windows side by side as well. So how do we do it. How do we get all these browsers easily? It should be as simple as clicking a button. There always is a simpler way! We simply need to find it. 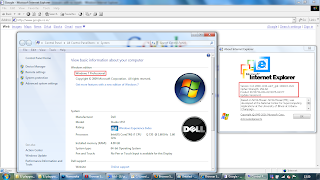 Follow these steps to get different versions of IE, Firefox, Chrome, Safari and Opera running side by side on your machine, without installing too many software's on your machine. Next, A window will open up, this is an instance of your shining new desired browser - And you are good to go! A note of caution: On slow internet connections this website could appear a little slow for the first run but subsequent runs are much faster. Don't give up on it. Its worth the wait! That's it! Have fun developing/testing your applications easily on various browsers and their different versions. 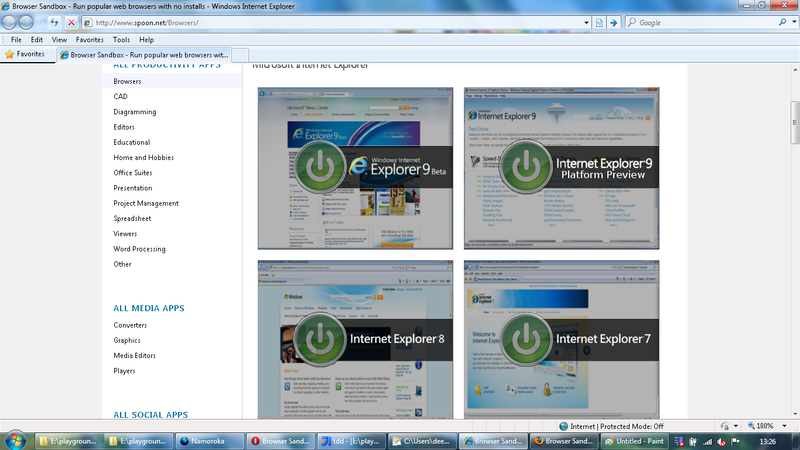 I didn't knew that these all versions of IE are possible to have on vista at the same time. This has really interested me a lot, as having vista I will be soon going to try this out.